The 1960s Church of Christ the King in New Vernon, NJ, now has 14 new Stations of the Cross paintings by Leonard Porter. The story of Jesus’s last hours has evolved since the birth of Christianity. Scholars have tried to uncover the historically accurate version of the events, and followers have added legends to the New Testament chronicle. Leonard Porter, a painter in Manhattan, has studied centuries of interpretations of what happened during Jesus&apos;s quarter-mile trail across Jerusalem, from Roman palace condemnation to hilltop death. 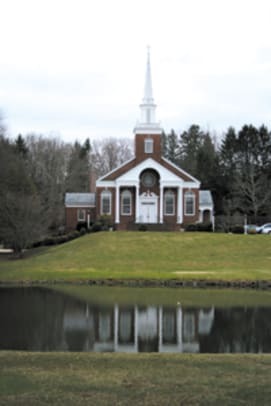 The Church of Christ the King in New Vernon, NJ, inspired his research and synthesis. Two years ago, the pastor, the Reverend Patrick G. O’Donovan, commissioned Porter to create 14 new Stations of the Cross paintings for the Wedgwood-blue nave in the 1960s brick church. 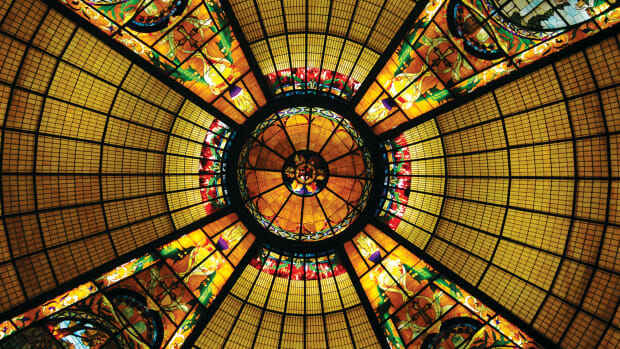 Porter drew on the sweep of Western art and architectural history to lay out a powerful narrative. His cherry-framed scenes do not distract during worship yet enormously reward close study. Porter at first analyzed the Colonial Revival building in New Vernon, with its Ionic portico and balustraded steeple. 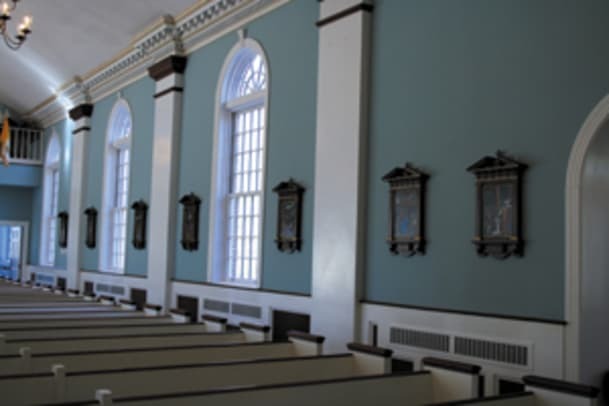 The interior pilasters and altar have Doric capitals, and mahogany bands top the white pews. 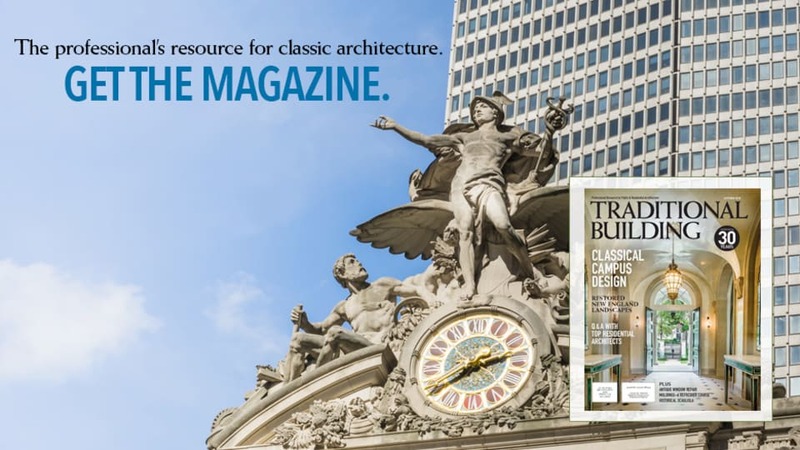 With architectural designer Christine G. H. Franck, Porter decided on cherry frames designed like aedicula composed of Doric pilasters and cross finials (built by Hull Historical Architectural Millwork, Fort Worth, TX, with water-gilded highlights from Cowood Gilders, Brooklyn, NY). The church’s architecture, in fact the entire Colonial Revival movement, has roots in ancient Rome, which helped inspire the backgrounds in Porter’s Station paintings. 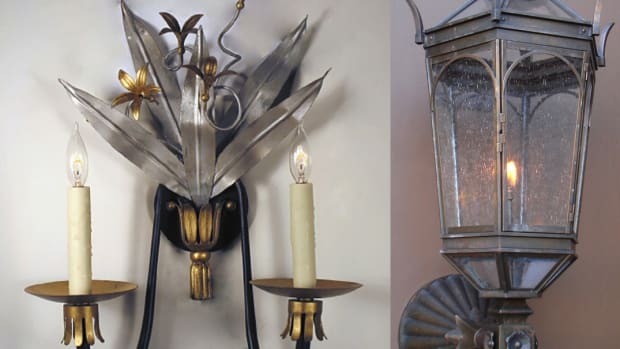 “It’s a kind of Jerusalem of the imagination through a Baroque Roman approach,” he says. He sketched all 14 scenes at once and completed the paintings in a marathon seven-month stretch. “It’s really important to be consistent,” he explains. 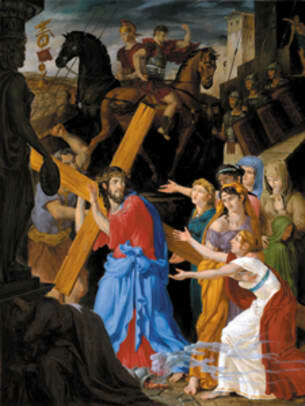 In his compositions, the human figures, Roman spears and horses, architectural and landscape elements and the Cross overlap at dynamic angles. “In between are these very dark holes, so it’s kind of punctured,” he says. Every detail propels the drama, suggests the characters’ thoughts and emotions and represents varied Catholic traditions. As Porter gave a recent tour of the sanctuary, he pointed out how remorse spreads across the face of Longinus, the Roman centurion who pierced Jesus’s side with a lance and later converted to Christianity. On the centurion’s gleaming metal belt, Porter incorporated an image of Hercules choosing virtue over pleasure. Longinus is shown ordering a cup of gall offered to Jesus; the potion is often interpreted as poison but actually would have served as a painkiller. “It’s an act of compassion on Longinus’s part,” Porter says. In the course of the 14 scenes, storm clouds and stiff winds sweep in and then give way to a hopeful, calm sunrise. Dark-skinned faces are visible here and there in the crowd of mourners and villains, since Jerusalem was a diverse trading post in Jesus’s lifetime. The procession passes actual Roman Imperial landmarks, including the Temple of the Sybil and a Hadrian’s Villa caryatid at Tivoli, Caius Cestius’ pyramidal tomb in Rome, the Royal Stoa and Robinson’s Arch on the Temple Mount, and the Jerusalem city walls. As Jesus collapses for the second time, a decrepit and nearly naked old man reaches for the laurel crown on an Imperial herm column, “as if to say there’s no glory for the empire in this,” Porter explains. The painter even researched what provincial Roman plumbing pipes looked like, to depict a fountain symbolizing the bliss of grace. Its U-shaped spout, supported on a cross-shaped bracket, directs water into an overflowing urn beside a staircase where Veronica kneels. She proffers her glowing white veil to mop the sweat from Jesus’s brow; the story does not appear in the Bible but was popularized sometime in the Middle Ages. As Jesus falters in Porter’s scenes, dents and fissures form on the Cross. “Its woodiness is asserting itself,” the artist says. In the last Stations, it sprouts roots in the shadow of a palm tree, symbolizing victory. “It’s becoming the tree of life,” he adds. Porter has visited the finished paintings in New Vernon, to explain his design process and the layers of symbolism to staff and congregants. On Good Friday, parishioners make formal counterclockwise tours of the paintings, contemplating the idea of self sacrifice for the greater good. 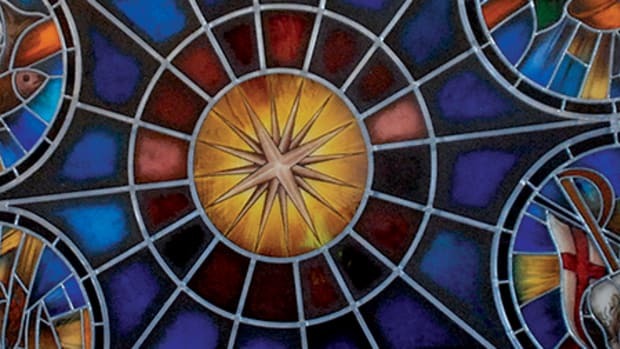 Even to the most casual observer peering in the church doorway, the art complements and enlivens the space. Hull’s dark Doric frames echo the pew trim, and Cowood Gilders’ subtle stripes gleam amid the red and blue jewel tones painted on the Jerusalem citizens’ robes. Franck says that at first she envisioned the frames entirely gilded. “I have this real love of gilt and blue walls. It’s the Adamesque part of me,” she says with a laugh. “But Leonard’s instinct for stained wood frames with gilded highlights was absolutely right for the space.” The basic aedicula design is all Porter’s, she adds; she did help tweak some proportions to align with Classical precedents. She also helped finalize working drawings with sections and side elevations for Hull’s craftspeople. 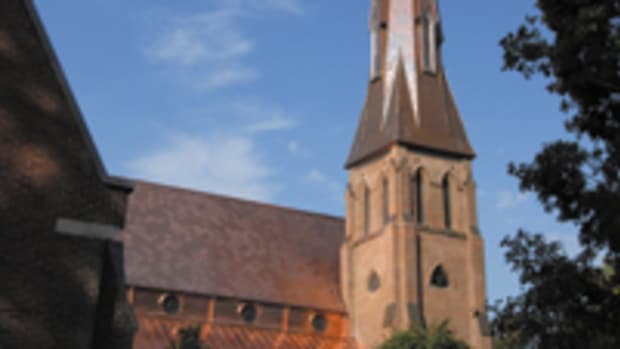 A church in Huntsville, AL, found that copper was the most economical and aesthetically pleasing solution when replacing its existing galvanized stamped shingles.